Jackson Police support the "Hub Club." Friday evening December 14th, the Mount Moriah Baptist Church family and Ella Watkins held a sleepover and informational retreat for young ladies at the Hub Club. Mrs. Watkins and Mount Moriah Baptist Church provided these young ladies with an evening filled with fun, games, and empowering information. Jackson Police Officer, Curtis Cozart, also provided the young ladies with valuable information. 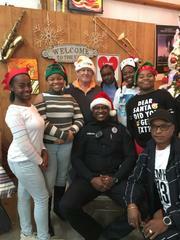 "It is opportunities like this that allow the Jackson Police Department to establish and build positive and meaningful relationships," said officer Cozart. The Jackson Police Department is excited to support those endeavoring to impact the community in a positive manner.